I'm doing a booksigning with 20 other romance and mystery authors on Saturday to help raise money for adult literacy. I'll be signing copies of Immortal Wolf. The first ten people who buy a copy, I'll be giving a FREE copy of my December release, HOLIDAY WITH A VAMPIRE III. Here's the link to the website for more information. Got word that Jasmin, the baby pictured here, has died. I'm not surprised. Not even sad or numb. Just resigned. I knew she would die. 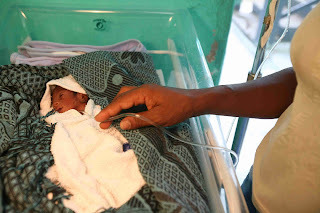 The hospital in Haiti where she was lacked an incubator, hell, they didn't even have feeding tubes to keep her alive. All they had was an IV to drip fluids into her, and a heating lamp that shone directly into the little girl's eyes. I've added her to my "2009 Wall of Death" at work. Four children whom we've met in the field and tried to save, and failed to save. They are on a filing cabinet, staring over my shoulder. I want them over my shoulder so I can feel their painful eyes on me, watching, silently asking, "Will you forget about us? Will our deaths mean nothing?"